TUMMYtunes is a communication tool designed for adopted children and their birthparents to help them establish a loving and long-term relationship through interaction at a distance. The project has developed focusing on a family involved in an open adoption, an adoption type that requires a level of collaboration between the natural parents and the adoptive parents, in favor of the child’s wellbeing. The system is characterized by the co-presence of tangible objects, intended for the child, and digital elements, for the adult. Five toys allow children to create visual and auditory content, which are automatically shared with their birthparents in the form of posts on Facebook. This same platform allows biological parents to update the content played by the toys, giving life to two-way ‘conversations’. The multimedia nature of the shared information provides users the opportunity to express themselves in different ways and choose the media that better reflects their personality. The age of children targeted by the project, between three to six years old, has also stimulated me to generate an emotional and playful communication, at the expense of functional information, which would not help foster a relationship of affection. The dolls share a human appearance and rounded shapes, but differ in the use of various color of fabrics, that want to reflect the nature of the interaction and the time of day for which they are intended. Taking into account the gradual development of the cognitive and linguistic skills of the child, each doll is independent, letting the parents decide when it is the best time to introduce them to the child. The storyteller allows biological parents to share the bedtime stories that have characterized their childhood. These audio tracks can be directly downloaded from the Internet or may be recorded by the parents themselves, to let the child fall asleep listening to the sound of their voices. In this way they can strengthen a bond formed already during pregnancy, through the mother’s voice, and creates a new ‘communication moment’ that can become part of the daily routine of the child life. Songs are often a good way to externalize not only our music preference, but also our state of mind. Children can also do it, reacting differently to each song. The vocalist, taking advantage of all the music sharing applications that Facebook offers its users, allows biological parents to share their playlists, while learning something about the emotional state of their child and being indirectly participants of playtime. The cuddly invites biological parents and children to share positive emotions and affection through the exchange of simple kisses. For a child feelings are among the most difficult things to share long distance, because they often require a more direct approach, articulated by gestures of ritual, like a kiss or an hug. 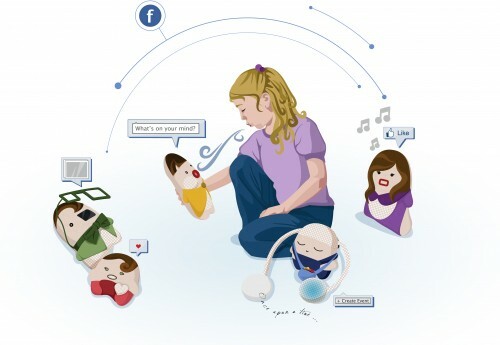 In this specific framework an immediate reply is fundamental for the effectiveness of the communication, so the interaction of this doll occurs in real time and is limited to when one of the two biological parents is connected to Facebook. The chatterbox is dedicated to the exchange of voice messages that allow the child to verbally share what happen during the day and facilitate the direct involvement of biological parents in their life. While other dolls are associated with moments of happiness and play, the chatterbox is distinguished for its ability to be effective even during the saddest of situations. After an argument with a friend at kindergarten or during a period of sickness, the child may feel the need to be supported and pampered, so the doll could act as an outlet.